There are several general settings that affect the Staff Portal as a whole. These settings are edited from the Staff Portal menu >Settings > Portal Settings. Several User ID permissions control a User's access to the Staff Portal menus and reports.To edit a User ID's permissions go to Tools > Edit Settings > User IDs. Click into the User ID and select User Permissions from the left menu. Scroll down to the Staff Portal permissions section to add/remove these permissions. Select a duration of time (between 5 min and 3 hours) after which your staff will be logged out of the Portal if they have not been active. Choose which Portal features you want to use. Select the Attendance, Skills/Levels and/or Time Clock feature by adding a check mark to the corresponding box. To allow staff to update information for a feature in the Portal when it has been launched remotely set Allow Remote (feature name) to Yes (the default is No). For example, to allow a staff person to not only view and print their schedules, but to also enter their time when they are accessing the Portal remotely, set Allow Remote Time Clock to Yes. Remote access is covered in more detail in the Launch the Staff Portal topic. 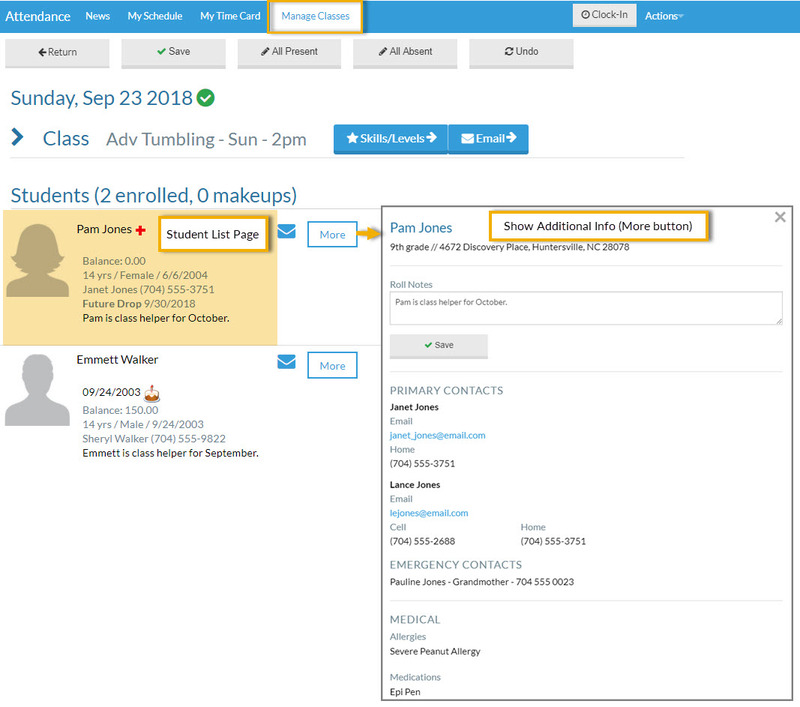 Use this section to customize the information that is displayed in the Staff Portal on the Student List Page and in Show Additional Info (More button).